Sheep to Shawl event at our beloved CSA Live Earth Farm. Info here. 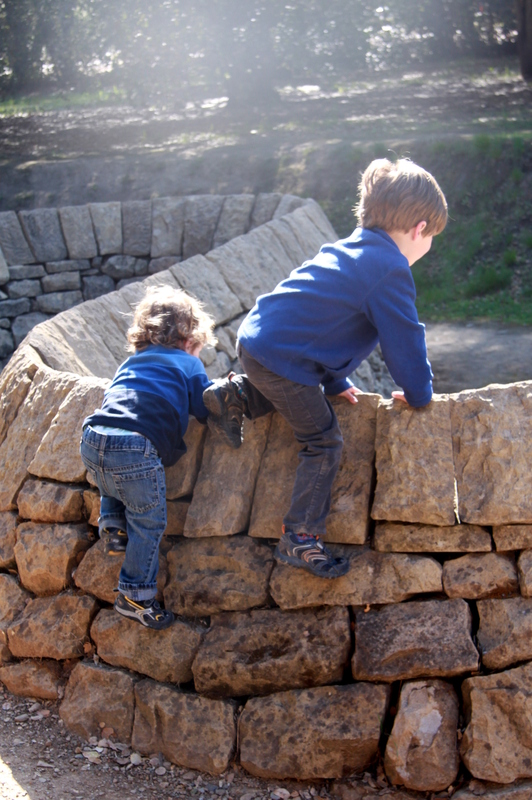 Daniels Nature Center Open Weekend (Skyline Ridge Open Space Preserve), noon-5pm both days. More info here. Los Altos Easter Egg Hunt, starts 10am. See here. Tour of Hidden Villa Farm — all ages welcome. Starts 11am. $10 a person. See here to register. Last week we spent a whole morning inspecting Stanford’s Stone River, or not so much inspecting it as climbing all over it. The Stone River is a 320 foot long sculpture by British artist Andy Goldsworthy located in a ditch (it’s meant to look like an excavation site) on the Stanford campus next to the Cantor Arts Center. I love the details of its creation: the river was constructed out of rubble from Stanford buildings destroyed in the 1906 and 1989 earthquakes and was shaped by a team of expert dry stone-wallers brought in from England and Scotland just for the task. Most events planned for this weekend seem to have been cancelled for rain. Sunday 1st April – there’s morning farm tour at Hidden Villa. Register here. Sunday May 13th, Mother’s Day Celebration at Hidden Villa. Register here. While we LOVE this place, I need to have a little rant after our visit yesterday. Why does every exhibit in the aquarium need it’s own ipad thingy on the wall next to it? It’s so distracting for kids. They were all crowded round the screens, pressing at them, and not looking at the wonderful, live animals in the tanks. I’m not sure the kids got any useful information from these screens. Even when used properly, they just have snippets of disjointed information that flash up and down almost too quickly to read. It was a perfect example of how technology can actually undermine education. I think the experience would be far better if they replaced these touch screens with more old-fashioned, and more informative, displays that don’t become the main attractions. Not knowing anything about this park other than that it’s reported to be quite beautiful, we took the opportunity one sunny spring afternoon to check it out. We were totally surprised by what we found: not by the scenery which was stunning, but by the park’s history. 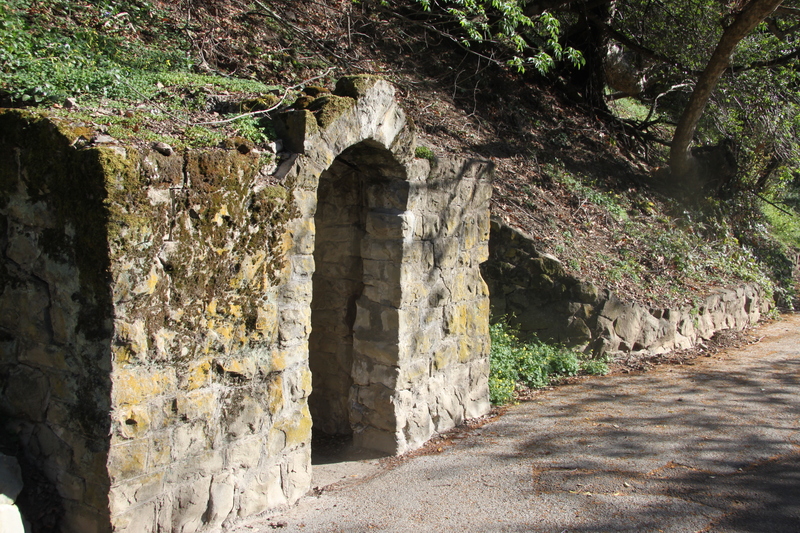 Did you know that Alum Rock Park used to be one of the most famous health spas in America? We didn’t. Between 1890 and 1932 it was operated commercially as a spa retreat and thousands of visitors rode the Alum Rock Steam Railroad to reach its mineral baths, indoor swimming pool, tea rooms, restaurants, and dance pavilion. It actually became so popular after the Second World War that the commercial enterprise started to damage the preserve and the health spa had to be shut down. What’s left now is a beautiful natural preserve with paths that wind in and out of abandoned mineral baths. It has a strange sort of Romanesque beauty and is most interesting to poke around. 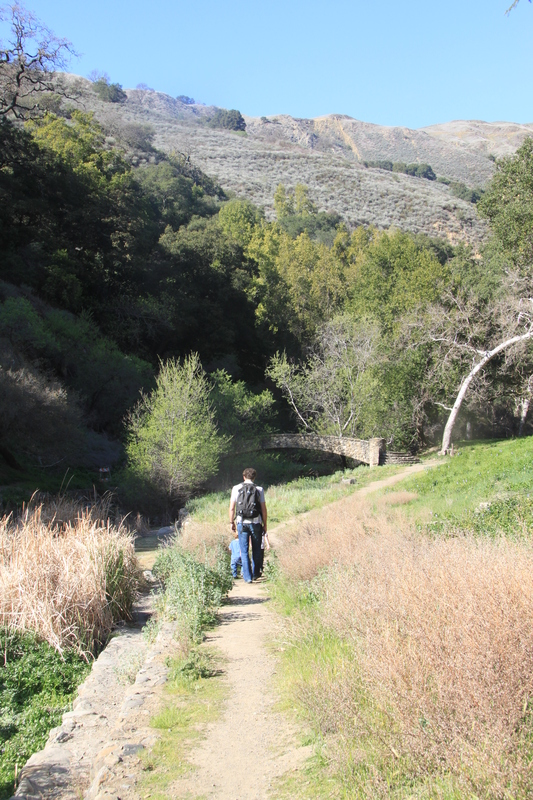 Alum Rock Park is basically a canyon in the Diablo Range foothills. It’s long and narrow with trails winding through the canyon connecting various picnic areas, abandoned spas and interpretive centers, and more isolated trails on the steep hill sides above. While appealing to grown ups, the wild, narrow, steep trails on the gorge sides are not suitable for toddlers and we gave them a pass for now, preferring to explore the shady canyon floor. Signs within the park are scarce and park maps are hard to come by on a busy day and not terribly helpful if you do find one (very small scale with few land marks indicated). One immediate word of warning–if you have small kids, ignore the suggestion you’ll find in many other park reviews to use the free parking outside the preserve. It’s a very long walk from that lot to the more interesting parts of Alum Rock. I recommend paying the $6 day use fee for more convenient access. Once in the park, I suggest continuing to the Visitor Center along the Penitencia Creek Road. This is off the road and a little hard to spot. Don’t stop at the first sign indicating the trail to the Visitor Center, it’s a long trail and you’re better off parking about a quarter of a mile up the road in the lot that’s actually by the center itself. The area around the Visitor Center itself is fun to explore: there are two nice playgrounds for preschoolers, one with giant animal shapes to climb. We then suggest walking left (as you face the center) and checking out the Youth Science Institute (entrance fee $1 adults and 50 cents for kids). This has a small but fun display about local flora and fauna. There are live snakes and spiders, a stuffed fox for stroking, and stuffed bobcats and mountain lions to show the kids. The YSI also inherited a strange, but intriguing, Victorian Collection of stuffed birds and it’s nice to be able to show children all the hawks and owls that they might see while hiking locally. I also liked their little curiosity table with bones and nests and preserved frogs that children are encouraged to explore and touch. The YSI has an attached aviary which houses injured “local” birds which the rangers sometimes bring out to show visitors. 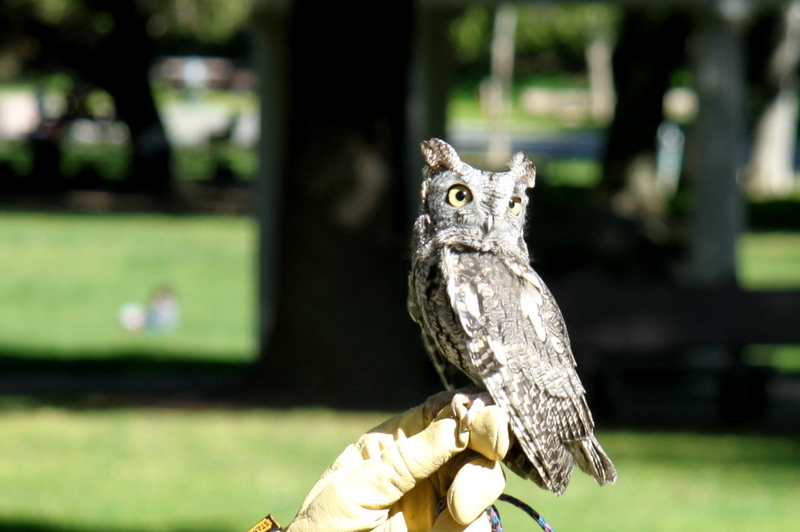 When we were there we were lucky enough to see a Western Screech Owl outside the building with its ranger minder. The kids, especially The Puppy Dog, thought this was pretty neat. To see the slightly surreal ruins of the health spa, continue along the path in the same direction. 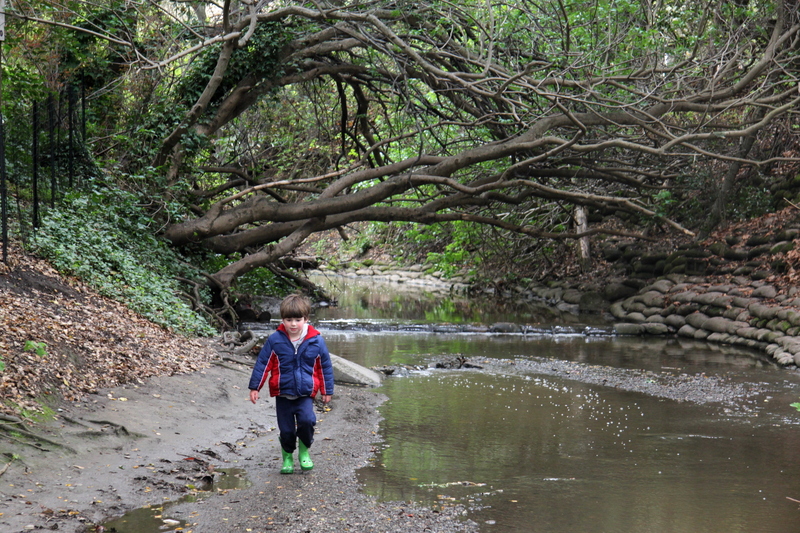 It’s a fairly short trail, only a few hundred yards, and is perfect for little children to walk–just watch them near the creek edge. 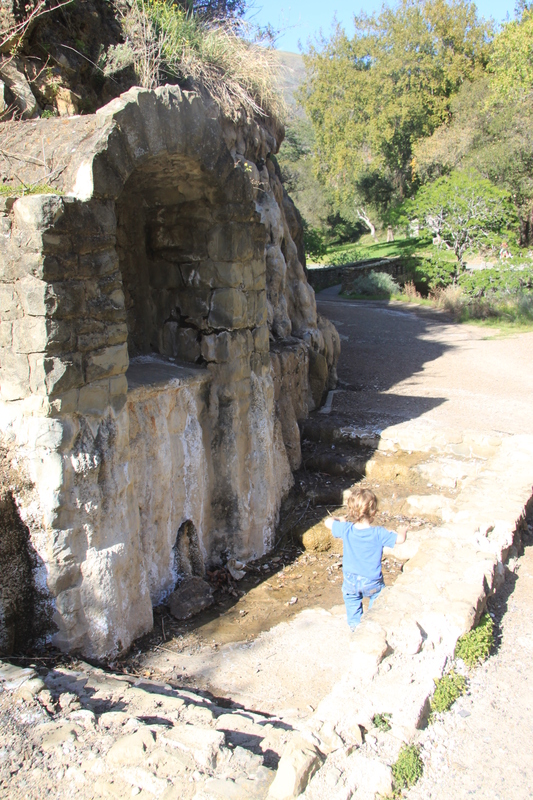 Both out boys really enjoyed seeing the springs emerging from the rocks, touching the mineral deposits and climbing into the (now empty) old stone spas. There are two or three bridges, depending how far you walk, and you can cross backwards and forwards across the creek to see the ruins on each side. Midway round the ‘Mineral Springs Loop’ (as the extremely unhelpful park map calls it) you’ll come to the Sycamore Grove which is perfect for snack time. Family Day at Elkus Ranch. See here for details. Registration required. Wingding Family Fest at Skyline Ridge Open Space Preserve, 10am-3pm. It’s a bird themed celebration of spring. Find the flyer here. CANCELLED. Enjoy a tour of Deer Hollow Farm in the Rancho San Antonio County Park, 10am-1pm, admission $5. The flyer is here. Family Bird Walk at the Don Edwards Bay Wildlife Refuge, 2.30-4.30pm. Recommended for kids aged 5-10, reservations required.